Sydney (AFP) - Captain Michael Clarke will return home Tuesday after aggravating a hamstring injury during Australia's embarrassing one-day international loss to Zimbabwe in Harare, Cricket Australia said. Clarke's sore left hamstring had kept him out of Australia's first two games of the series, which also involves South Africa, and it flared up again in the course of his 68 as Australia went down by three wickets. The Australian captain looked uncomfortable for large parts of his innings, but the injury worsened after he tweaked the hamstring completing a second run in the 40th over. Clarke continued to bat until the 43rd over, when it became clear that his difficulty running between the wickets was hampering Australia's bid for some much-needed late runs. 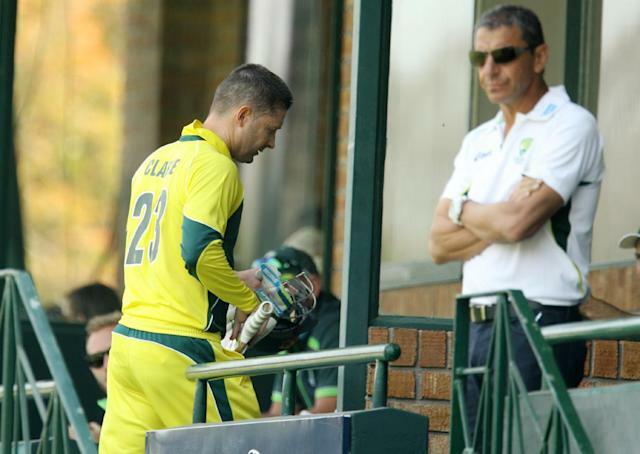 "Michael aggravated his left hamstring while batting against Zimbabwe today and will not be able to take any further part in the tri-series," Australia team physiotherapist David Beakley said Monday. "Michael will return to Sydney on Tuesday to undergo scans and further assessment to determine the full extent of the injury." Zimbabwe's only previous win over the Australians was at Trent Bridge in the 1983 World Cup, in the first ever encounter between the two sides. Sunday's defeat was a humbling experience for Australia, who misread conditions and left out leg-spinning all rounder Steve Smith, and under-estimated Zimbabwe by resting premier fast bowler Mitchell Johnson.